AIIMS MBBS 2018 LIVE: The examination was held in two shifts, morning and afternoon, in online mode, on May 26 and May 27, 2018, and the results will be out on June 18, 2018. AIIMS MBBS 2018 LIVE: The examination was held in two shifts, morning and afternoon, in online mode, on May 26 and May 27, 2018. AIIMS MBBS 2018 LIVE: The All India Institute of Medical Sciences has conducted the examinations for admission into medical courses at various centres across the country. The examination was held in two shifts, morning and afternoon, in online mode, on May 26 and May 27, 2018, and the results will be out on June 18, 2018. The AIIMS entrance examination is a gateway to the most prestigious medical college in the country. This year’s notification has introduced some important changes regarding the exam schedule and the number of seats available and the campuses. The good news is that two new AIIMS campuses offering 50 seats each, will also be opening for admissions, from this year onwards. The entrance exam is held for admission into MBBS course at AIIMS New Delhi, Patna, Bhopal, Jodhpur, Bhubaneshwar, Rishikesh, Raipur, Guntur (Andhra Pradesh) and Nagpur (Maharashtra). An approximate of 807 seats are offered for the students. 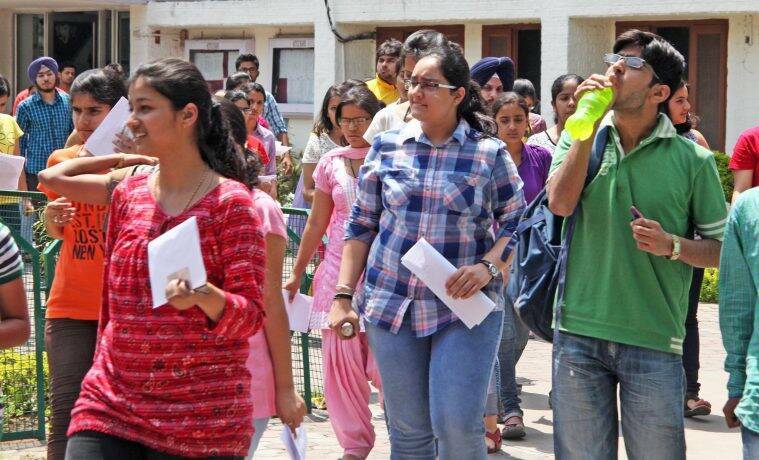 The All India Institute of Medical Sciences (AIIMS) MBBS entrance examination was concluded. The examination was conducted in two shifts, May 26 and May 27. The results will be declared on June 18. Those who have come out of the first shift found the physics paper very tough due to lenghty and complicated calculation and biology was found to be easy. GK and Logical reasoning, Chemistry along with logical reasoning and general knowledge was of moderate level. The exam is over now. Not sure what will be the rank. Around 30 questions of physics was tough (*according to me). #AIIMS2018 horrible condition for test conducted at Turbhe centre of :iON digital zone IDZ. No fans no air-conditioning.. students were sweating profusely n were still giving test..no choice @PrakashJavdekar @HRDMinistry @aiims_newdelhi is this how we treat bonafide students?? Last year, a total of 4905 candidates qualified in this examination. 1828 female and 2077 male candidates and were eligible for the counselling session for admission in AIIMS. The cut-off percentage last year for the eneral category was 50 per cent, while for OBC it was 45 per cent and for SC/ST it was 40 per cent. The percentile for the general category last year was 99.0014978, for OBC it was 97.4205359 and for SC/ST it was 94.1220114. In order to be eligible for AIIMS MBBS examination, aspirants should have passed/appearing or appeared class 12 examination or its equivalent with the subjects of English, physics, chemistry and biology with 60 per cent marks (50 per cent for SC/ST/OPH candidates) in aggregate. He/she should be minimum 17 year old. Last year's topper was Nishita Purohit from Surat, Gujarat. All top 10 rank holders were from the Allen coaching centre, Kota. While 7 students had studied in classroom, rest three were from distance learning. The counselling procedure at AIIMS started from July 3 and the classes began from August 1. Last year, the entrance exam was conducted on May 28 for nearly 2.8 lakh students across the country. There were reports of paper leak andthe result was declared after an internal committee rejected the allegations of a paper leak by Anand Rai, a Bhopal-based doctor. There will be a total of 200 questions. They will be multiple choice questions and reason assertion-based and the candidate will be given 1 mark for a correct answer and 1/3 will be deducted if the answer is wrong. People have posted motivational messages on social media websites like Twitter for those appearing for AIIMS MBBS 2018. The exam duration is 3 hours and 30 minutes. AIIMS MBBS 2018 result will be declared for these candidates on June 18, around three weeks after the exam is conducted. Counselling for these candidates will be conducted in the months of July, August and September 2018. Ornaments of any sort are not allowed. Mobile phones, wristwatches and an electronic device including those capable of transmission and receipt of any data in any form, pens, papers, books, bottles etc are also forbidden. The facility of a simple calculator that pops-up on the screen will be available. Items which candidates cannot take inside the examination hall include - clips, bands, hats, caps, scarf, and similar headgear as well as goggles, thick-soled footwear and large buttons (more than 1.5 cms). If religion or customs requires one to wear any particular headgear or attire, then one should visit the centre early to allow adequate time for frisking. It is mandatory for the candidates to carry their admit card inside the hall. Along with the admit card, they should carry a valid photo ID proof in original (passport, Aadhar card/ Aadhar card print out, PAN card, voters ID, driving license, recognised central or state board, examination admit card/marks card/ result sheet bearing photograph. Those appearing for the exam tomorrow, on May 27, should keep this in mind. An email and SMS was sent to all PWBD candidates to indicate that if they have inability to read the question on the computer screen. As only a few candidates/guardians had responded, it was again requested to guardians of PWBD candidates who cannot read the questions on the computer screen and/or cannot write/click mouse to answer question on computer to fill a form available on MyPage after login in using their login credentials. Those who cannot read the questions on the computer screen and/or cannot write/click mouse to answer on computer can bring a scribe to assist them during the examination. This year's notification had introduced some important changes regarding the exam schedule, the number of seats available and the campuses. The good news is that two new AIIMS campuses offering 50 seats each, will also be opening for admissions, from this year onwards. Candidates belonging to unreserved category must score at least 50 per cent, those belonging to OBC (non-creamy layer) must score at least 45 per cent and those belonging to SC/ST must score at least 40 per cent in order to be considered eligible for further counselling process of AIIMS MBBS. Over two lakh candidates are appearing for the AIIMS (All India Institute of Medical Sciences) MBBS entrance examination today on May 26. The exam is a gateway for admission into MBBS course at AIIMS New Delhi, Patna, Bhopal, Jodhpur, Bhubaneshwar, Rishikesh, Raipur, Guntur (Andhra Pradesh) and Nagpur (Maharashtra). There are 800 seats available in the above mentioned institutes. The online examination (computer based test) is being conducted in two shifts per day (9 am to 12:30 pm and 3 pm to 6:30 pm) at various centres across the country. AIIMS was conducting the examinations in two shifts morning and afternoon, in online mode, on May 26 and May 27, 2018. The entrance exam was held for admission into MBBS course at AIIMS New Delhi, Patna, Bhopal, Jodhpur, Bhubaneshwar, Rishikesh, Raipur, Guntur (Andhra Pradesh) and Nagpur (Maharashtra). An approximate of 807 seats are offered for the students. 3 CBSE 12th result 2018: What are last 5 years toppers doing these days?